My doctor advises me to exercise more. I need to walk at least two hours a week. 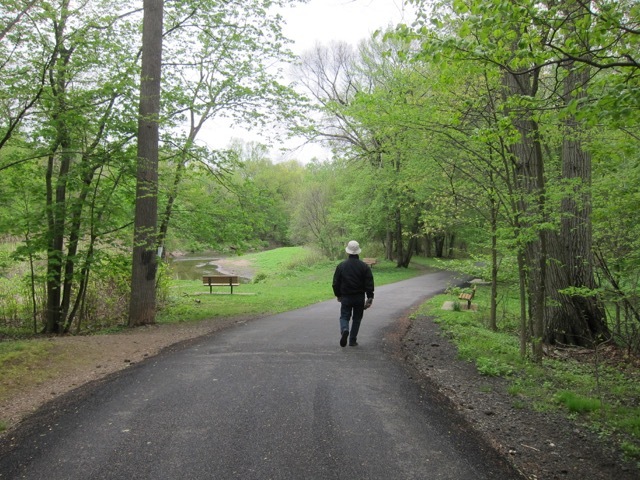 Near our house in New Jersey in the suburb of New York City, there is a park along the small meandering Saddle River. 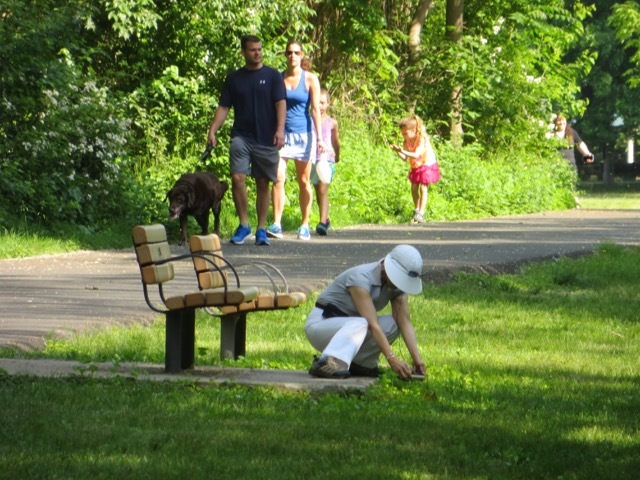 Sally and I make it a habit to walk on its path for an hour almost every day. 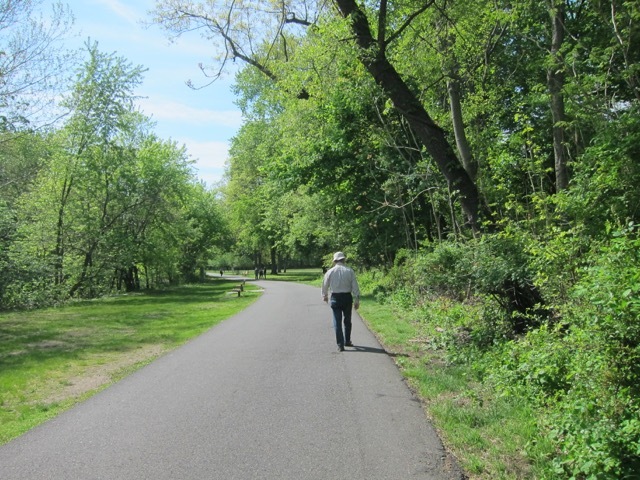 I walk briskly to build up a sweat, and Sally walks a little slower at her own pace. 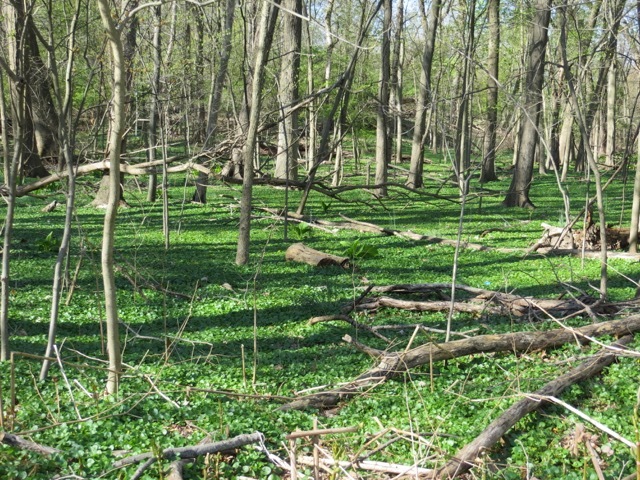 In early Spring, the forest ground cover is green before tree leaves emerge. 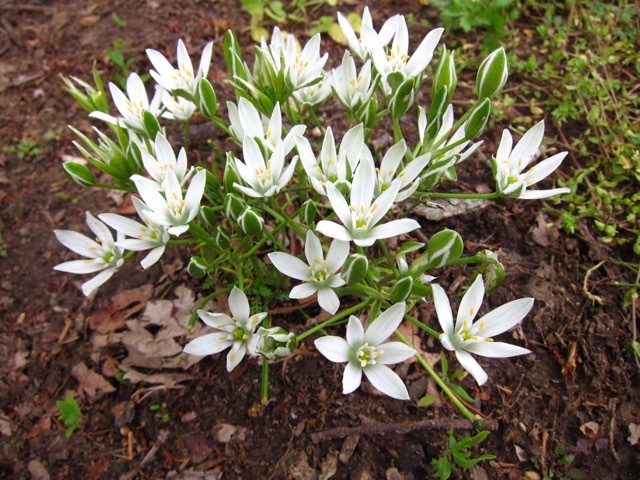 Beautiful wild flowers break through the ground. 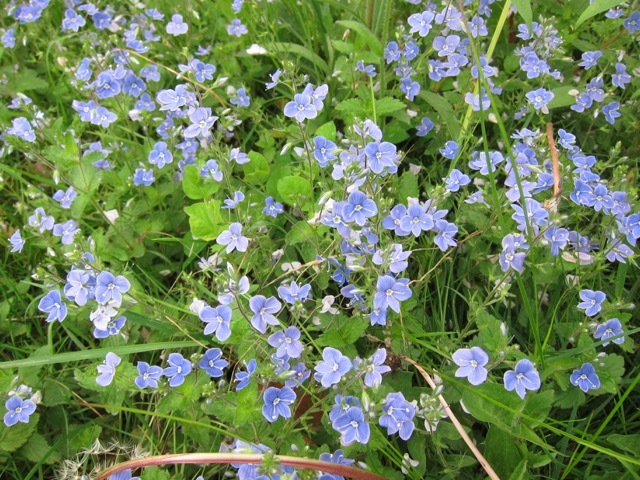 Patches of violets are lovely to see. Sally gets close to the ground to take pictures of tiny berries. 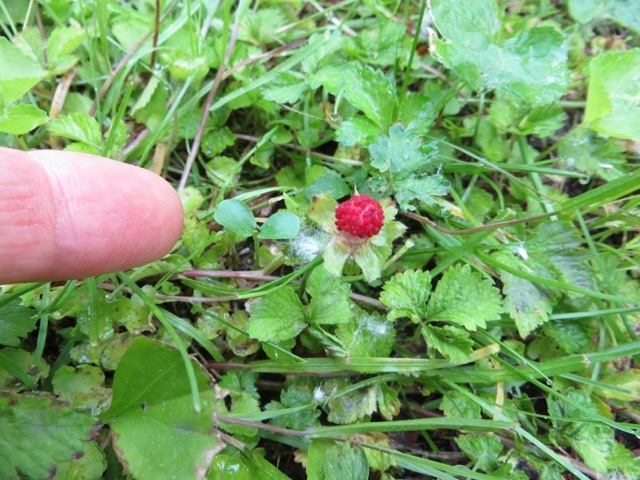 This pretty little berry is ready for the birds. 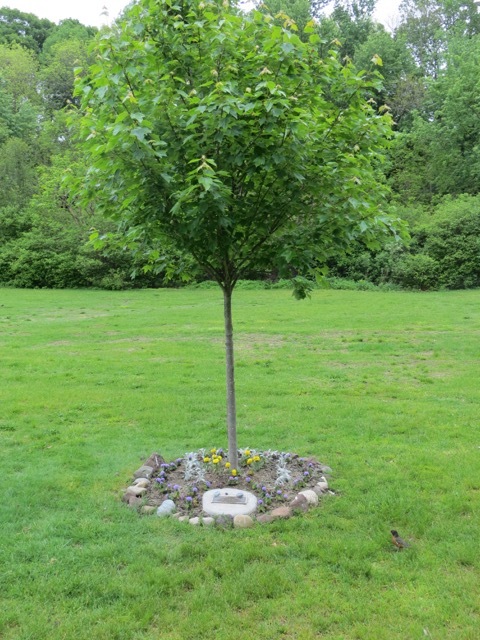 Some donors to the park’s funds have trees dedicated to their loved ones. 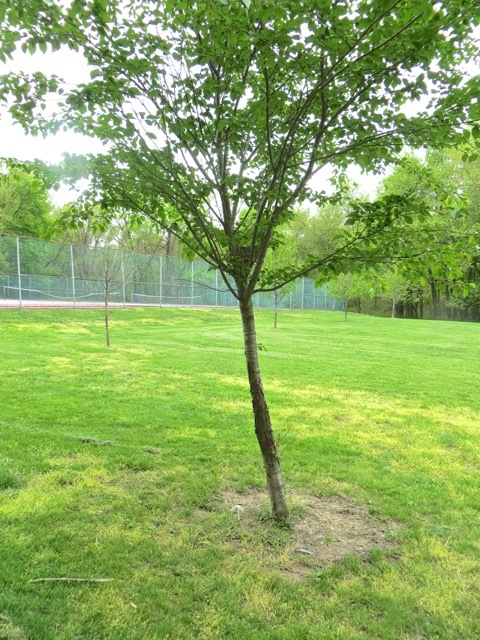 The donors of this tree decorate their tree with flowers. The river is clean and is stocked with trout. Fisher folks can catch 4 trouts a day, and they have to be longer than 9 inches. 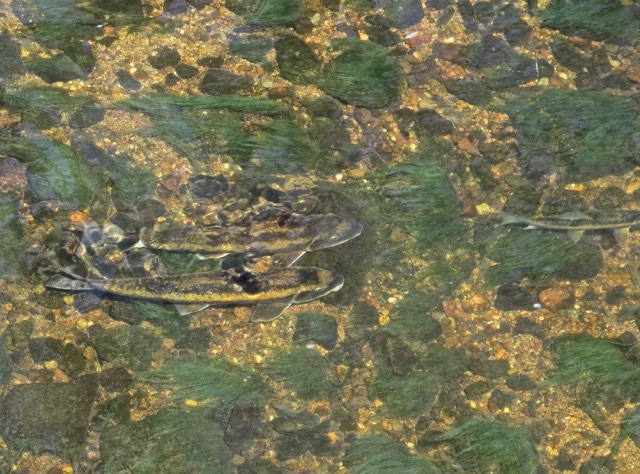 These fish in shallow water are big enough to be legally caught. 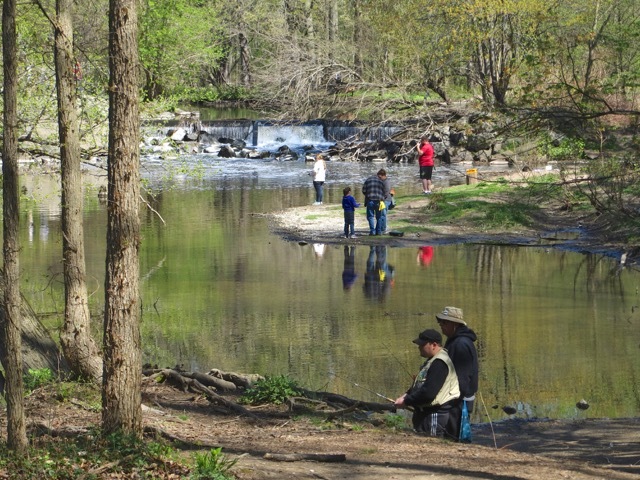 On a Sunday afternoon, the river attracts several fishers. 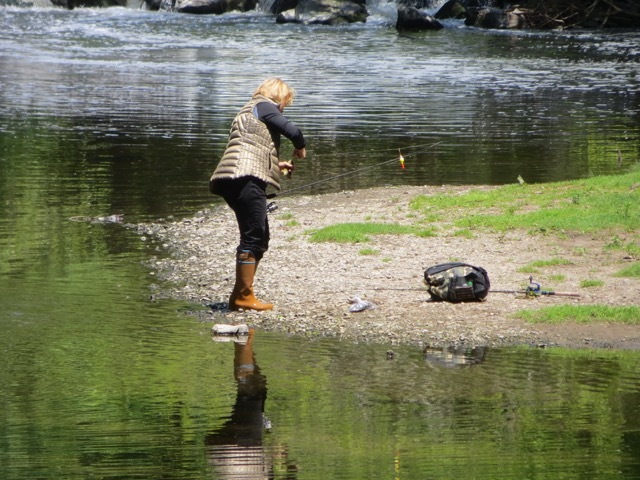 A woman catches a fish and is removing the hook from the fish. 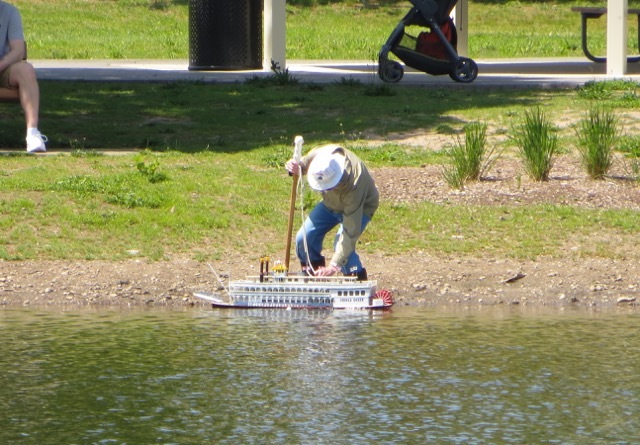 In a nearby pond, a man plays with his radio-controlled model of a paddle-wheel boat. 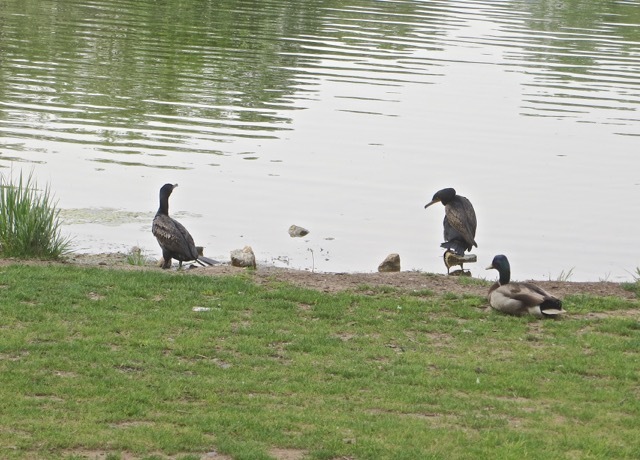 Two cormorants make a rare appearance at the pond. A duck watches them impassively. A family of geese gather by the river. 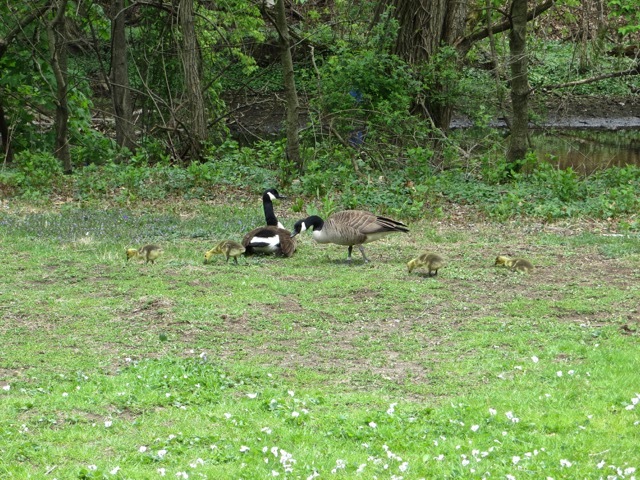 Young goslings follow their parents from birth and feed themselves. 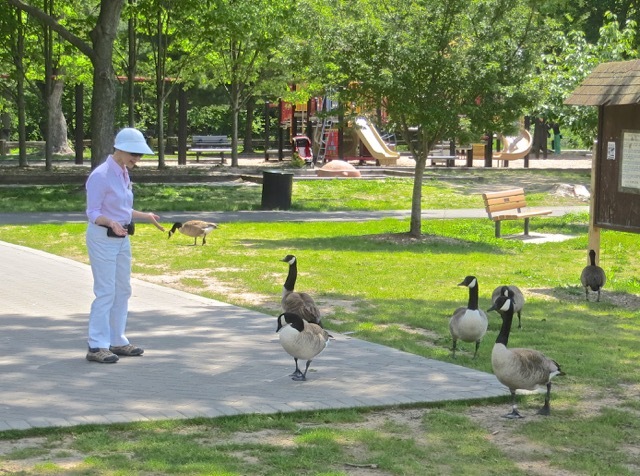 Sally has a friendly conversation with a gaggle of geese. I am sure they are not discussing world politics. 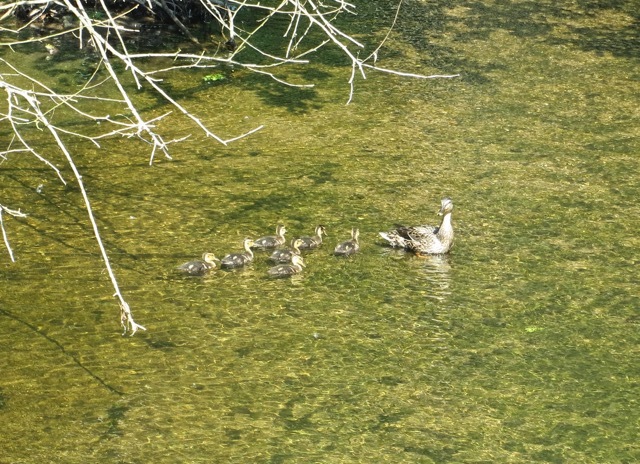 A mother duck leads her six ducklings in a flotilla. 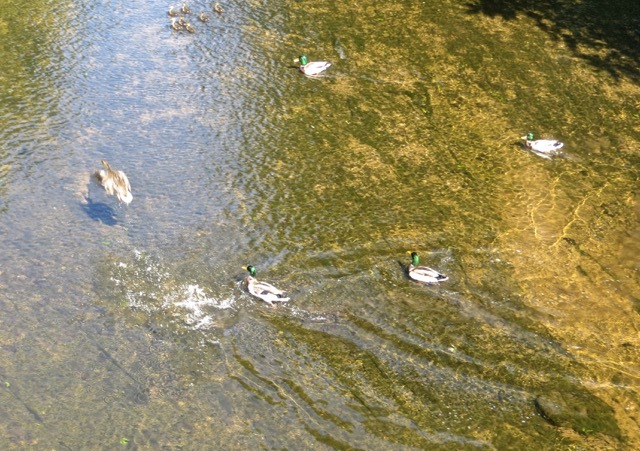 For some unknown reason, four male ducks chase the mother duck into flight. Her ducklings stay in formation. Along the path, I find a bird’s nest six feet off the ground in a sapling. 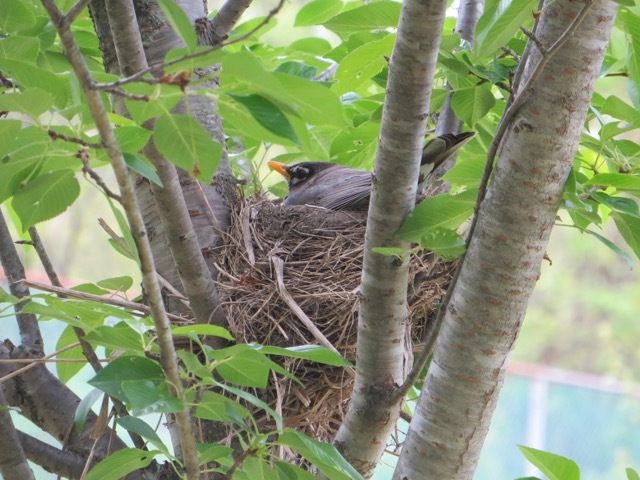 A robin incubates her eggs. There are two eggs in the nest. 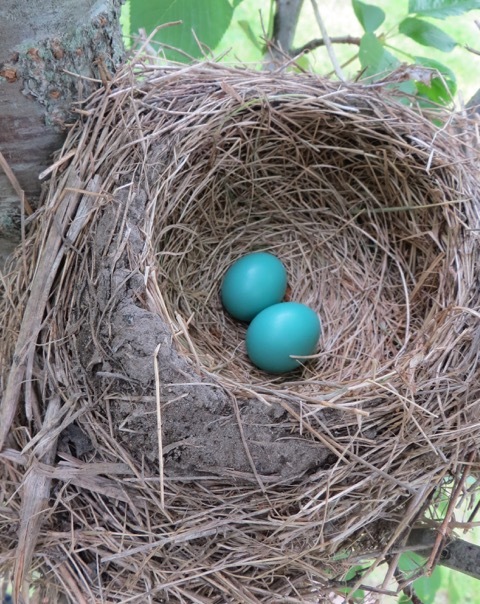 The unique color of the eggs coined the “robin’s egg blue”. 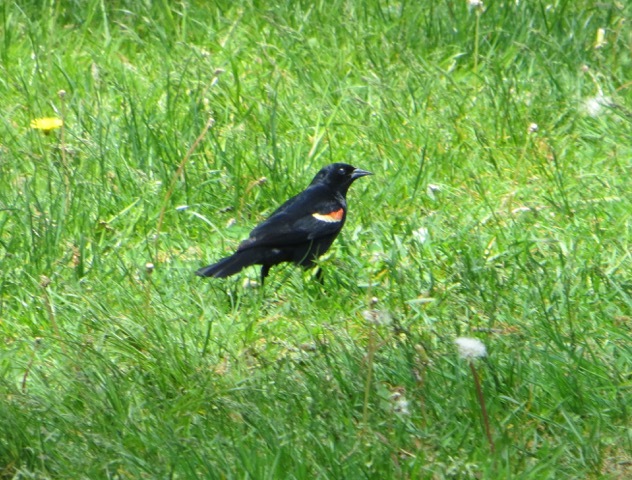 A red-winged blackbird hops on the grass. 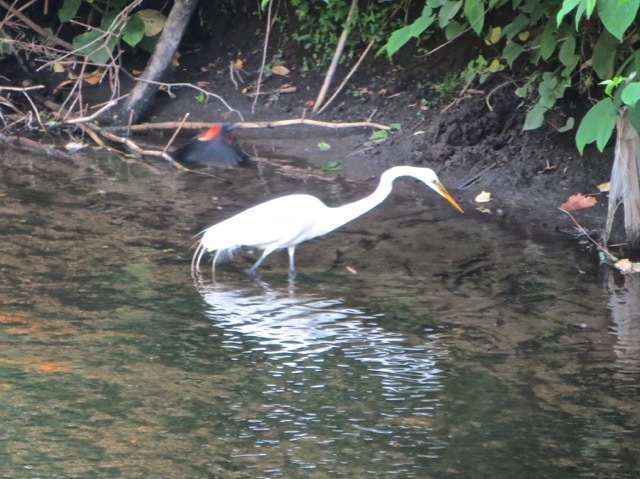 A white egret wades near the river shore, apparently too close to a blackbird’s nest. 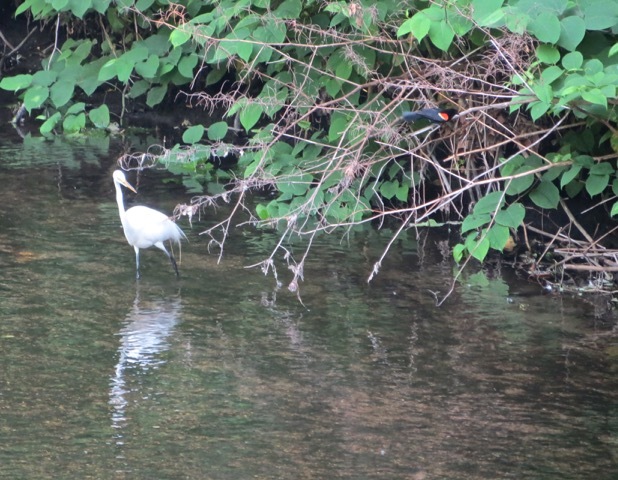 A vigilant blackbird follows the egret’s every move. The blackbird swoops at the egret several times, determined to drive it away. Eventually, the egret flies away followed by a flock of a dozen blackbirds, robins, and other birds. The blackbird calls on its friends to gang up on the egret. 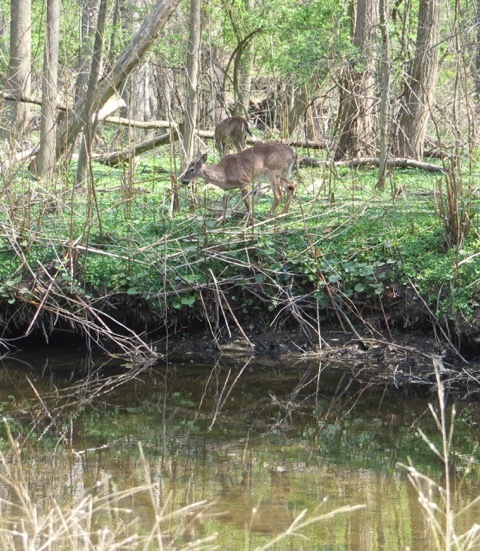 Across the river, a few deers graze on new shoots. We are fortunate in having this nice park only 5 minutes from our house. My doctor will be happy with my progress. Posted by Robert Wu on Monday, May 30, 2016, at 10:40 am. Filed under Uncategorized. Follow any responses to this post with its comments RSS feed. You can post a comment or trackback from your blog.